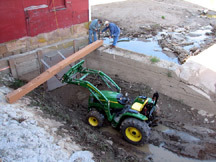 Once the gate was set I cut down a large Ash tree behind the mill and had a friend cut it into a beam with his Woodmizer. Here Joe is helping me install it. It will hold the trash rack. Trash rack – 2 X 6 White Oak boards running from Ash beam to ground about 1 1/2 in. apart. This will catch sticks, leaves … etc.